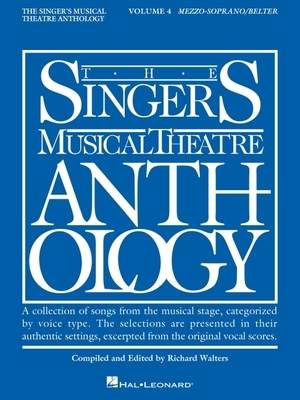 Singer's Musical Theatre Anthology: Mezzo-Soprano/Belter Volume 4 (Paperback) | The Drama Book Shop, Inc.
(Vocal Collection). Contents: AIDA: The Past Is Another Land, I Know the Truth * ANNIE GET YOUR GUN: I Got Lost in His Arms * ASPECTS OF LOVE: Anything But Lonely * AVENUE Q: There's a Fine, Fine Line * THE BEAUTIFUL GAME: Our Kind of Love * BELLS ARE RINGING: I' m Going Back * THE BEST LITTLE WHOREHOUSE IN TEXAS: Hard Candy Christmas * THE BOY FROM OZ: Don't Cry Out Loud * CHESS: Heaven Help My Heart * CHICAGO: Nowadays, Roxie * A CHORUS LINE: The Music and the Mirror * ELEGIES FOR ANGELS, PUNKS, AND RAGING QUEENS: Angels, Punks, and Raging Queens * FOLLIES: I' m Still Here * THE FULL MONTY: Life with Harold * GRAND HOTEL: I Want to Go to Hollywood * GREASE: There Are Worse Things I Could Do * HAIRSPRAY: I Can Hear the Bells, Miss Baltimore Crabs * I LOVE YOU, YOU'RE PERFECT, NOW CHANGE: I Will Be Loved Tonight * JESUS CHRIST SUPERSTAR: I Don't Know How to Love Him * THE LAST FIVE YEARS: Still Hurting, See I' m Smiling * THE LION KING: Shadowland * MONTY PYTHON'S SPAMALOT: Whatever Happened to My Part? * THE PRODUCERS: When You Got It, Flaunt It * SONGS FOR NEW WORLD: Just One Step * A STAR IS BORN (film): The Man that Got Away * THOROUGHLY MODERN MILLIE: Gimme Gimme * WICKED: Popular, I' m Not that Girl, The Wizard and I * THE WILD PARTY: Look at Me Now, How Did We Come to This? * WISH YOU WERE HERE: Shopping Around * WONDERFUL TOWN: One Hundred Easy Ways.